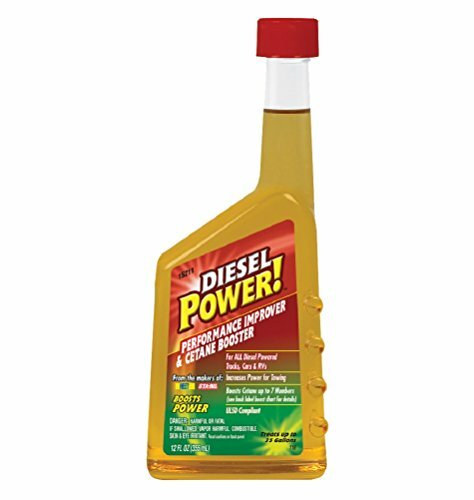 Diesel Power Performance Improver and Cetane Booster works with all diesel engines. It is a special formula that increases power for towing and maximizes fuel economy. This 12 ounce product treats up to 35 gallons of fuel. Headquartered in the heart of Chicago's industrial hub, Gold Eagle Co. is a privately held company, founded in 1932 by Armin Hirsch. For more than 75 years, Gold Eagle has been an industry pioneer in the production and distribution of aftermarket fluids and additives as well as an innovator and leader in the product development, manufacturing, marketing, and distribution of branded engine performance and maintenance chemicals. The Retail and Installer Brands Group within Gold Eagle Co. markets and sells more than 100 branded products, while its Private Brands Group supplies over 400 different OEM and private branded products into the majority of the top engine-related original equipment manufacturers and retail marketers. If you have any questions about this product by DieselPower, contact us by completing and submitting the form below. If you are looking for a specif part number, please include it with your message. BestLine Superior Lubricants 853796001269 Premium Synthetic Diesel Fuel Treatment, 16 fl. oz.